Okay, I think I'm the last person to hear about Scentsy. My friend from high school, Dianna, was telling me about "Wickless Candles" and I had no idea what she was talking about. A month later...I am totally addicted. Basically it is a candle that you plug in instead of light. "Scentsy is the safest alternative to burning candles in your home. The wax is always warm, never hot. It’s melted by the warmth of a 25 watt light bulb, not an open flame. There are never harmful emissions, just wonderful Scentsy scents. " I am a self-proclaimed candle junkie, so these little babies are right up my alley. Especially since my toddler can't burn herself on them. Right now I am "burning" the Sunkissed Citrus and it is fantastic. (I LOVE citrus scents. They get me excited for spring cleaning. My house may not be clean, but it smells like it.) I have a list of like 20 scents to try. I am deciding between "Beach" and "Mediterranean Spa" for the scent in the babies room. Maybe that will make the 3am feedings like a mini vacation. Or at least it will keep it from smelling like spit-up. And since the wax is melted with a light bulb, it can work as the nightlight too! Cool shower gift or mother's day gift! Dianna is a lead Scentsy Consultant, and she is going to send one reader a wall plug-in with 2 Scentsy Bars of their choice! To enter, click on the Scentsy catalog and comment on this post what product/scent you are most tempted by. The font is a bit small, so if you have a small computer screen, you may want to download the catalog. You can see a list of the scents here as well. For a second entry, let me know in a separate comment that you are a Natalie's Sentiments follower/Goggle reader/subscriber. I will announce the winner on March 18th. Good luck! If you have any questions about Scentsy, would like to place an order or are interested in becoming a consultant, check out the Scentsy website or email Dianna. You're not the last. I am. lol. I have perused the catalog, and I LOVE everything. Seriously. All the candles/candleholders are cute especially the pagoda one and the island collection. The scent I would pick is probably the lilacs and violet one. Love it! Count me in!! I would like the groovy brown heater and the havana Cabana & Sunkissed citrus scents. Come on over to my blog and register for my pearl earrings giveaway too, ok? I would like the embellished warmer! I have tarts at home, and nothing to put them in!! I love any of the Scentsy bricks! Happy Spring Fling! I love candles, too, and I think I want everything in their catalog. Everything. A wonderful idea. I love anything Vanilla. I saw a Vanilla Cream that sounds great. 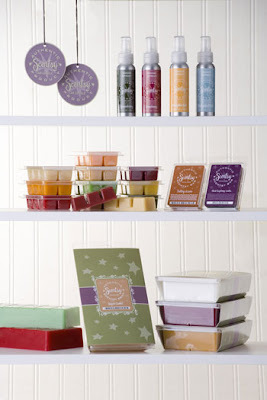 I have heard of Scentsy but have never used any of the products. I would love anything under the Bakery Scents but if I had to pick one I would choose Sugar Cookie. My best friend gave me a 'scentsy' for Christmas and I LOVE IT. The scents smell amazing and last a long time. I'll have to follow suite and and say Sunkissed Citrus sounds yummy. Really anything fruity and spicy are right up my alley. I LOVE Sunkissed Citrus. I'm also a huge fan of the Pommegranite Orange - or is it Orange Pommegranite? Anyway - it smells fabulous! I could also totally use a car candle to put in my pantry wher the stinky garbage is!! Clean Breeze sounds like one I would love. Thanks for the chance to win! Just the sound of Orange Dreamsicle makes me feel warm and fuzzy. They have really neat stuff! The coconut lemongrass sounds delish! Oooh! Sign me up. Any scent is fine. I want the animal print warmers. Pop by my blog for a chance to win a Stampin' Up! stamp set. Love, love, love scentsy!!!! It's all over my house and could really use more!!! Stop by my blog and sign up for my giveaway! I want my house to smell clean too so I want to try sunkissed citrus. Thanks for sharing! I love the yummy cranberry mango scent. It's my favorite. I LOVE camu camu. It's the best! I just read about Scentsy on another blog a few weeks ago, but I still haven't tried it. I would love to try the Havana Cabana. I lover summery beach smells! Home Sweet Home and Blueberry Cheesecake. I'd like the sweet pea & vanilla scent! I'm obsessed with Scentsy! Their Mother's day sale rocks!! I love sunkissed citrus,all their sprays are fantastic, Dang, I hope I win!! I have a giveaway too. i've never heard of scentsy before today so I think I want to try everything. seriously! I was a candle junkie until I burned my kitchen cabinet. Maybe, I could try this new safe alternative. I am also a follower. Sorry, I like citrus smells also and Honeydew Melon. the lilac and the violet sounds great to me! I like the brown in the Isabella collection but I really want to try the plug ins! I first got mine about a year ago and love it! Wouldn't mind being a consultant and as far as i know there aren't any in my area (Tulsa, ok). I want to try the black raspberry vanilla! Oh how fun! I would love the Vanilla Cream...they sound yummy smelling! I love the sunkissed citrus. Falling Leaves (because i love fall!!) and Sea Breeze :O) thanks so much for the chance to win!!! I am all about food-scents but Scentsy's Cinnamon Vanilla is my FAVORITE! Makes me want to use the wax as perfume. And the Green Weave heater would look rather nice in my kitchen. I'm super excited about all of the new spring/summer scents but the orange dreamsicle sounds good enough to eat. If I win, I promise I won't!! There are so many choices! I really like the island warmers. And at the moment can't decide on which scents I like the best. The sunkissed citrus makes me think of summer and I can't wait for it to get here. After this long snowy winter I am ready for some summer. I think the Sun-Kissed Citrus is a scent I would love and would bring some of that sunshine feel into the house. I would love the Groovy Black one with Home Sweet Home! I'm also a subsciber, I have an award for you on my blog. Its been a couple of days I didnt know if you had seen it yet or not. I love the cherry blossom heater and the coconut lemongrass sounds like it would smell heavenly! Love this! I think it would be a toss up between verbena berry and welcome home. Oh, I'm a follower--well, I have you bookmarked in my bloggy favs, actually! I just love their Island Collection my favorite is the Malta and I like the CLean Breeze scent. Oh wow! Count me in!! Sun-kissed citrus and pumpkin roll sound very tempting! It looks like you are having a great time with Scentsy! I love their products! Dreamsicle & Vanilla Cream first then all the others! I've never herd of Scentsy before but I'm sure intrigued! I've never heard of them either. Looks like great stuff though! I am a lover of all things strawberry, so I'd probably go for the Strawberry Sweetie. I also think I would like the Autumn Sunset! I'd love, love, love to try the Perfectly Pomengranate scent. Thanks for the giveaway! I really like the Groovy White Plug-in Warmer. That is very nice. Thank you! Havana Cabana Grapefruit Pomegranate Cinnamon Vanilla Welcome home and TWILIGHT! Hi. I just heard of Scentsy recently, but haven't gotten 1 yet. I like the Dandy black plug in warmer. Clean breeze or blueberry cheesecake! I have been hearing alot about these and would love to try them! Lovin' the Safari Collection! If I could pick any scent, I would try the Clove & Cinnamon. Coconut Citrus Parfait sounds GREAT! Because I have spring fever, I've got to go with lilacs and lavender. If it was fall, I'd probably go for the vanilla and cinnamon one. What a cool idea, especially w/ kids... no burning flames! I would love the welcome home scent, and the lots of lavendar scent! Congrats on your new little blessing! What a gift for your little girl... a sibling! Couldn't read the scents very well, but anything with a just out of the oven smell, love it! ♥ Oh the Cinnamon Vanilla and Coconut Lemongrass sound great. I've never smelled any of their stuff but I have a friend that loves their stuff! Mmm...Lavender. Of course lemon lavender smells so clean to me. I love the retro chic one. Adorable! The welcome home scent sounds good to me! I love the island collection too. of course you are a diva....dont you know....it takes one to know one! lol! I would really love to try the Lots of Lavender and the Black Raspberry Vanilla. I love the plug in product and the Welcome Home scent sounds appealing. I would love to win any one of these! Hi! The retro chic one would go great in my kitchen. I've heard of Scentsy before and LOVE it, but haven't gotten anything. As for scents, sunkissed citrus sounds very springy. Oh, and I am a subscriber too! Thank you! Cool product. Definitely Sunkissed Citrus to make home smell clean. It would be fun to try Havana Cabana or Perfectly Pomegranate. Cherry blossom or coconut lemongrass! thanks for the chance. I'd love to try the Sun-kissed citrus. I would love to have the home sweet home! :-) The scent sounds wonderful and I just Love the name!! I love sweet pea and vanilla. My DH really likes Sweet Pea, a lot. I have a tealight tart burner and have really been wanting an electric one, I just LOVE the looks of the Isabella Collection ones! The catalog is great! I can not pick. I am going to go with Sunkissed Citrus candle. I love, love, love candles. I love Scentsy! These scents sound great. Dreamsicle, black raspberry vanilla, sweet pea and vanilla, Perfectly Pomegranate...too many to choose from!! i lOVE all the citrus ones...pommegranite would be awesome too!!! The Sun-kissed citrus and Coconut Lemongrass sounds wonderful! thanks so much for the giveaway! I really love the Pembrooke warmer too! It's so pretty! Sunkissed Citrus would be my choice! I'd go with the Orange Dreamcicle scent and the Coconut Lemongrass. Thanks! Coconut Lemongrass. A marriage of two of my favorite scents. Yum!